This Pope Francis I is for real. He is refocusing the church message away from disputes over doctrine to pastoral needs, looking after the poor and the needy. That should always have been the core message of the church. Pope Francis sent another message of humility and service to the 1.2 million Catholics in the world by washing the feet of 12 young offenders, including a Muslim and two girls, at a prison in Rome. The Pope, who took up the position less than two weeks ago, celebrated Holy Thursday Mass at the Casal del Marmo youth prison, outside Rome. Pope Francis I opted once more for a less formal, lavish style. Ordinarily this Holy Thursday Mass would be celebrated by the pope at the grand Basilica of St. John Lateran, in the city’s center. The prison ombudsman Angiolo Marroni told the press that out of the 12 young inmates two of them were girls, one Italian Catholic and one of Serbian Muslim origin. Catholic traditionalists are likely to be angered by the inclusion of women in the ceremony. 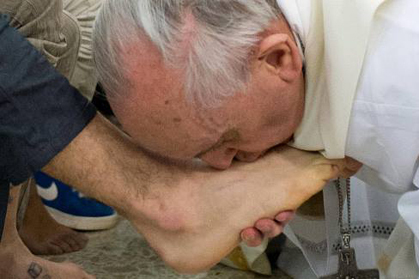 No pope in history has ever washed the feet of a woman before. During the ceremony Pope Francis used a wooden crucifix and kneeler, made by the inmates in the detention center's workshop. In return, he brought the young offenders Easter eggs and colomba, a traditional Italian Easter cake in the shape of a dove, the Vatican revealed. The washing of the feet is a tradition based on the belief that Jesus washed the feet of his 12 Apostles on the evening of the Last Super. Pope Francis told the inmates “This is a symbol, it is a sign. Washing your feet means I am at your service. “Help one another. This is what Jesus teaches us. Speaking at a Mass at the Vatican, prior to the ceremony, the Pope told the Catholic Church's priests to stop their “soul-searching” and “introspection." He spoke to the 2,000 cardinals, archbishops and priests along with over 10,000 Catholic faithful at St. Peter's Basilica. The Pope said the oil used to ordain priests was meant “for the edges” of society “for the poor, prisoners and the sick, for those who are in sorrow and alone." He also called on the Catholic Church to be more open and socially active. He told the directly that priests should be "shepherds who have the smell of their sheep." Since his appointment Pope Francis has continually opted for the more humble, in dress and accommodation, snubbing the Papal apartments in the Apostolic Palace to live in a public guesthouse and dine with the other residents. Last week he also phoned his old news agents in Buenos Aires himself to cancel subscription. On Palm Sunday the Pope drove through St. Peter’s Square in the “pope mobile” minus the bullet-proof glass. The smiling Catholic leader shook hands with the public and kissed babies among the thousands of faithful at the Vatican. The new Pope continues to emulate the message of Saint Francis of Assisi and is the first pope in 2,000 years to take this name. On Good Friday Pope Benedict again broke with tradition by including prayers of peace written by children in the Middle East in his ceremonies. The Good Friday celebrations centered around two ceremonies first the recitation of the Passion of Christ, the story of Jesus’ life at St. Peter’s Basilica followed by a torch-lit procession “Via Crucis” (“Way of the Cross”) around Rome’s Colosseum in the evening. The prayers included in Pope Francis’ celebration are written by a group of Lebanese young people chosen by the Maronite Patriarch Bechara Rai. They include texts: "Come, Holy Spirit, to console and strengthen Christians, especially those from the Middle East." Another reads: "Let us pray that the displaced and the forced migrants may soon return to their homes and lands." Services for Holy Week will conclude with the Pope’s first blessing “Urbi et Orbi” (“to the City [of Rome] and to the World”) on Easter Sunday. In the meantime we can only watch and admire.